Home Community News Good Stuff to Cheer You Up on Tax Day! Good Stuff to Cheer You Up on Tax Day! Alexandria, VA – Feeling a bit broke on April 15? Take advantage of these specials and feel better fast! Boston Market: The $10.40 Tax Day meal special includes a half chicken individual meal with two sides, cornbread, and a regular fountain beverage drink, while supplies last. No coupon is needed. Offer available from April 10-15 at restaurants and for online delivery. Bruegger’s Bagels: Get 13 bagels and two tubs of cream cheeses, for $10.40 from April 10-15 at participating bakeries. To get this offer, be a member of the Bruegger’s Inner Circle or claim the offer at www.brueggers.com. BurgerFi: Celebrate Tax Day with $4.15 BurgerFi Cheeseburgers on Monday, April 15 through the BurgerFi app only. Download the app at www.burgerfi.com/rewards. Great American Cookies: Get one free Original Chocolate Chip Cookies at participating locations. Hardee’s: The fast food chain is giving away free sausage biscuits from 7 to 10 a.m. Tax Day at participating locations. Say, “Made from scratch.” One per customer, while supplies last. Tax not included. Noodles & Company: Members of NoodlesREWARDS get $4 off online and mobile orders of $10 or more for Tax Day. The offer is valid from April 10-15, but to get the offer be signed up for the program by April 9. Sign up at www.noodles.com/rewards. Planet Fitness: From April 11-20, members and non-members can use available HydroMassage chairs with a coupon available at www.planetfitness.com starting April 11. Potbelly Sandwich Shop: Get a buy-one-get-one free entrée at locations on 4/15 when you mention that it is Tax Day. 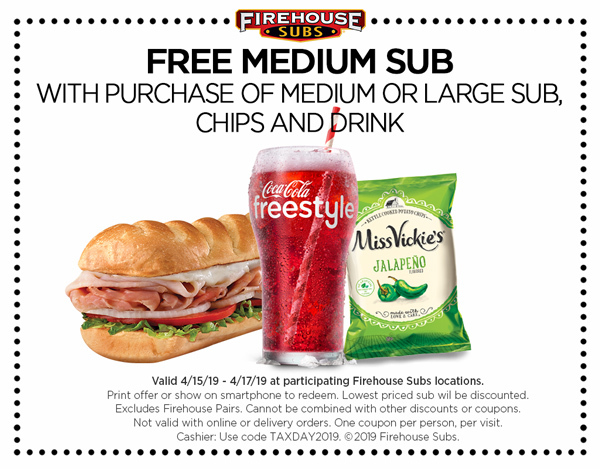 Schlotzsky’s: Get a free small original sandwich with purchase of chips and a medium drink on Tax Day. Smoothie King: Get $2 off any 20-ounce smoothie April 15-18 with Smoothie King’s Healthy Rewards app. More information at www.smoothieking.com/taxday. Sign up for the app at www.smoothieking.com/healthy-rewards.